After a bride picks out her stunning, jaw-dropping bridal gown that she’s fallen head over heels (literally) in love with, the second most exciting thing to do is to choose her wedding accessories and jewelry! This is a very important part of the bridal attire planning process as jewelry helps you define your overall look and can accent your dress and features beautifully. 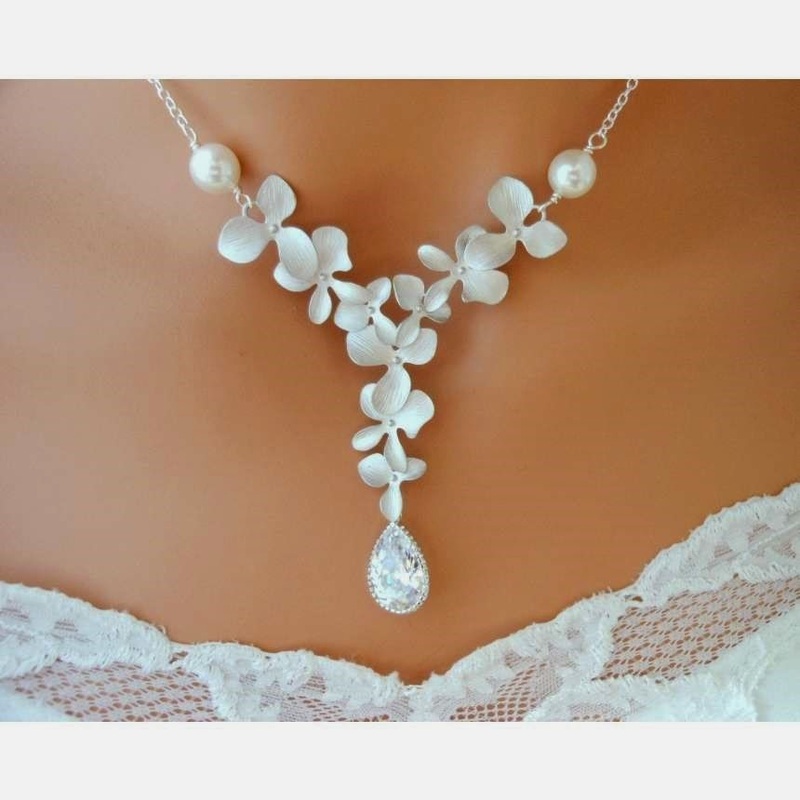 Look for pieces that not only make a statement, but pieces that you know will portray the perfect image that you’re looking to showcase come wedding day. Here are a few tips on selecting the perfect wedding jewelry. Earrings are one of the most important pieces of wedding jewelry besides your engagement ring and wedding band. They are the finishing touch to any outfit, and besides adding to the beauty of your completed look, they frame your face and highlight aspects of your make up and facial features. Before you settle on those lovely pair of sparklers, however, there are a few things to keep in mind. Have a look at your dress and note the features and embellishments. You want your earrings to compliment the accents of your gown, not overpower them. 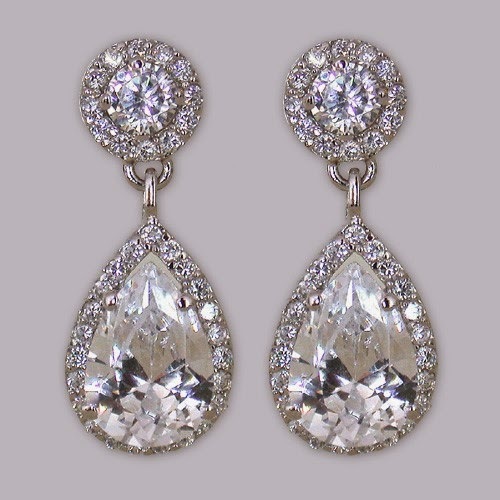 If your dress is extravagant, make sure that your earrings are more subtle. Drop earrings or pearls are perfect for that subtle, low-key look. Likewise, if your dress is simpler in style, choose earrings that will help the dress to stand out a little more. White crystals or even coloured stone earrings such as ruby or sapphire will help give that beautiful edge to your dress and overall bridal look. Also figure out what kind of hairstyle you’re going to have on your wedding day; hair up or down? In a bun or flowing elegantly down your back? You don’t want your earrings to get caught in your hair or be uncomfortable. The wedding necklace that you wear will depend upon the style of your wedding dress, the type of neckline, and how much detail the neckline and bodice has. Again like the earrings, you don’t want your necklace to upstage the features of your dress or to outshine them; you want them to compliment your dress and give a nod to the overall statement you want to portray on your wedding day. If your dress has lots of details and intricate beading and embellishments, a necklace probably isn’t necessary. Let your dress speak for itself; you don’t want a look that’s too busy. As a last necklace tip, generally try to go with the neckline of your dress to determine what kind of neck jewellery you should wear. For a strapless dress, feel free to wear what you love, and don’t be afraid to show off your neckline with a flattering piece. For scoop, square, or sweetheart necklines, try to find a necklace that will go with the shape and flow of the neckline. The more it compliments your dress, the better. If your dress has a halter top neckline or features a single strap, let the neckline do the talking, along with your earrings and any bracelets you’ll be wearing on the day of. Help put together your entire wedding look with a beautiful bracelet that is sure to be a real stunner. Slip on a simple chain, that’s both elegant and stylish, or, make a bold statement with a festive sparkler that jingles as you party. Make sure you don’t plan on wearing a long sleeved wedding gown or gloves if you want to adorn your wrist with a bracelet, as your special piece may not be seen this way. A bold bracelet is also great if your dress has a simple neckline or you’re choosing not to wear a necklace. Remember to choose the piece of jewelry that you want to stand out the most so that everything coordinates and compliments each other. While you’re trying on different types of beautiful wedding jewelry for your big day, don’t forget to also consider what you’ll be wearing in your hair. 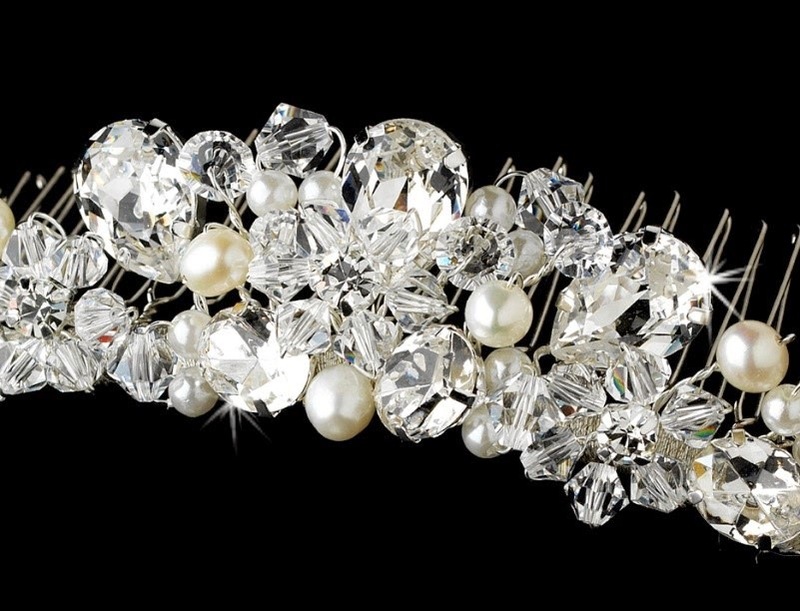 Headbands, tiaras, headpieces, combs, fresh flowers and even hats can all help to complete the perfect bridal look. Remember to stick to one type of accessory for your hair, and play that up to its fullest so that it creates the look you want without it being overpowering. Headbands do an excellent job of keeping hair off your face so that everyone can see your beautiful bridal glow in your eyes and in your cheeks. If you want to go for a princess look by using a tiara, rhinestones are always popular and they catch the light beautifully. Headpieces are also lovely, and you can choose from an array of materials to place in your hair. Some pieces are made out of plastic and some are made of more sturdy material and decorated with rhinestones, lace, pearls, crystals, silk flowers, or even sequins. Depending on the style of the headpiece, these can work with either short or long hair, and some designs are even built into a comb from which you can attach a veil to. There are many options out there so try everything to see what you like, and don’t be afraid to experiment with pretty colours, textures, and materials to find pieces that are just right for you.